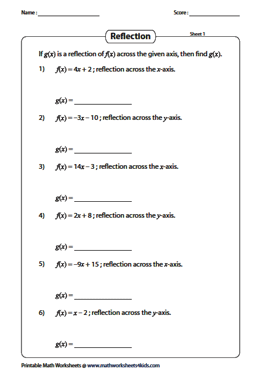 This ensemble of transformation worksheets is targeted to help learners gain an understanding of the transformation of a linear function and its graph. Find the indicated transformed function g(x) from its parent function f(x). Basic knowledge of translation such as horizontal shift and vertical shift; reflection, horizontal / vertical stretches and horizontal / vertical compressions are required to solve these transformation worksheets. A number of free printable worksheets are available for practice. Look at the parent function y = f(x) and shift it right, left, up or down and draw the translated graph g(x). 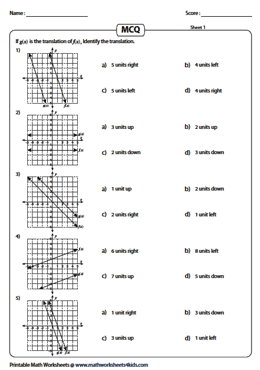 Use the answer key to verify the vertical or horizontal shifts. In this set of transformation worksheets, for every linear function f(x), apply the translation and find the new translated function g(x). Follow the relevant rules f(x) + c / f(x) - c to make vertical shifts of c units up/down and f(x + c) / f(x - c) to make horizontal shifts of c units left/right. Find the reflection of each linear function f(x). A reflection over the x- axis should display a negative sign in front of the entire function i.e. -f(x). Negate the independent variable x in f(x), for a mirror image over the y- axis. 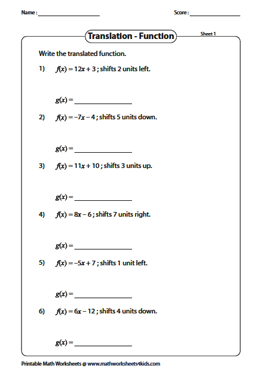 This series of worksheets requires learners to find the vertical stretch or compression by multiplying the function f(x) by the given factor and the horizontal stretch or compression by multiplying the independent variable x by the reciprocal of the given factor. Use the relevant rules to make the correct transformations. 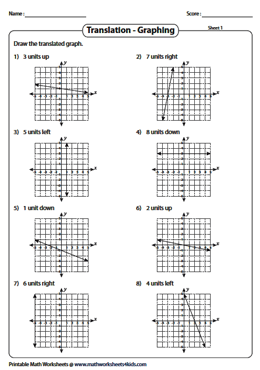 In this set of transformation worksheets, test your comprehension on translation of graphs. Each grid has two graphs, the original graph f(x) and the translated graph g(x). Find the correct vertical or horizontal shift.